The eighteenth Cape HOMEMAKERS Expo, which took place from Thursday (29 August) to Sunday (1 September) at the CTICC, was again a roaring success, attracting more than 36 400 visitors. KSA members once again put in a huge effort to produce stands of an excellent standard. 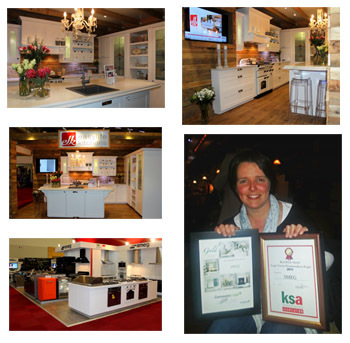 Special mention must go to Smeg who were awarded the best KSA stand and a gold certificate by the judges and Easylife Kitchens who wowed everyone with a stunning contemporary country kitchen winning a gold certificate. It was disappointing to see so few kitchen exhibits and Easylife must to be acknowledged for their continued support of exhibitions and for representing the industry at the show so professionally. Silver certificates also went to KSA members: Eclipse Furniture, Eurafrican, and Lansdowne Boards. Says John Leyden, Business Development Director of HOMEMAKERS: “The 2013 Cape Homemakers Expo was again a huge success with many exhibitors reporting record sales and business leads that will keep them busy for months to come. “The quality of the exhibits were once again of an extremely high standard. Even the typical Cape Town winter weather played its part in convincing consumers to visit an indoor event. We would like to extend a heartfelt thanks to all our exhibitors, visitors, sponsors and service providers for their contribution to the success of this year’s expo,” Leyden concluded. For more information please contact HOMEMAKERS Cape on (021) 511 2800 or visit the website www.homemakersonline.co.za.